Home > Clothing Deals > Target.com Clearance: Kids Swimsuits for $2.98!! Target.com Clearance: Kids Swimsuits for $2.98!! The best time to buy a swim suit is in the fall! 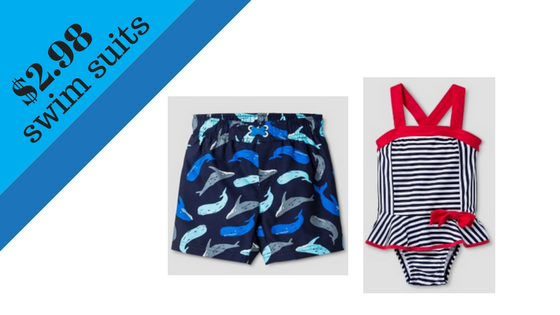 Target is helping you learn that with huge clearance deals on kids swim suits right now. Get adorable swim wear starting at $2.98 (reg. $10+). There are over 400 item to pick from! Tip: Pay with your Target REDCard and get another 5% off and free shipping on any order size. If you don’t have a Target REDCard shipping is free with a $35+ order. Even the more “expensive” items at $3.58 are a steal! If you want swim suits for adults, they are also on clearance with items starting around $10 (reg. $30+).